A robust consumer spending environment drove strong growth for the leading credit card brand last year. Shares of Visa (NYSE:V) climbed 15.7% last year, according to data provided by S&P Global Market Intelligence. 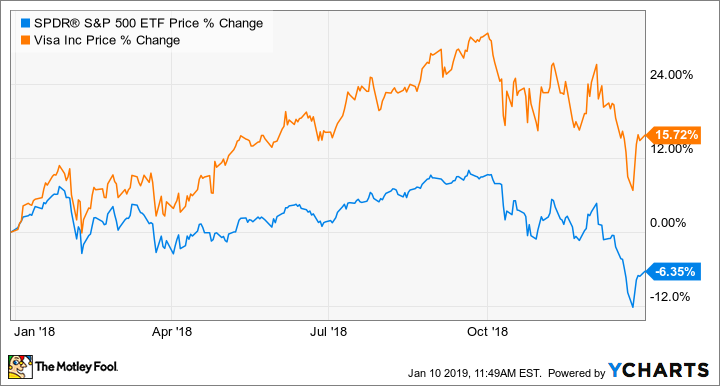 The stock took a dip toward the end of the year, along with the broader market, but it was a solid year of operating results for the No. 1 credit card brand. A healthy consumer spending environment drove strong operating performance for Visa last year. In fiscal 2018 (which ended in September), net operating revenue climbed 12% over the previous year, while adjusted earnings per share soared 32% year over year. CEO Alfred Kelly said, "We closed our fiscal year with strong momentum, delivering robust revenue and earnings growth fueled by double-digit increases in payments volume, cross-border volume, and processed transactions." Visa's strong results continue to point to a substantial long-term opportunity to tackle the 90% of global transactions that are still done in cash, check, and legacy Automated Clearing House (ACH). What's more, with its pole position in the payments industry, Visa stands to benefit from the growth of mobile payments, as Apple, PayPal Holdings, Alphabet, and other digital wallet providers choose to partner with established payment providers like Visa instead of competing with existing credit card networks. For fiscal 2019, management expects results similar last year's, with the only negative being that earnings won't grow quite as fast due to the lapping of the lower tax rate as a result of tax reform passed in 2017. Net revenue growth is expected to be in the low double digits, while adjusted earnings per share is expected to grow in the mid-teens. In late December, Mastercard reported that retail spending during the holidays was the strongest it had been in six years. Investors will find out how that translated to Visa's fiscal first-quarter operating performance when the company announces earnings results on Jan. 30. Check out the latest Visa earnings call transcript.